Unlike a studio production, many factors can adversely affect your television sports shoot including weather, lighting, and natural sound. A successful shoot is dependent on extensive planning, careful budgetting, technology, location, and a thorough understanding of the intricacies of the sport itself. With so much at stake, why not learn from an expert? 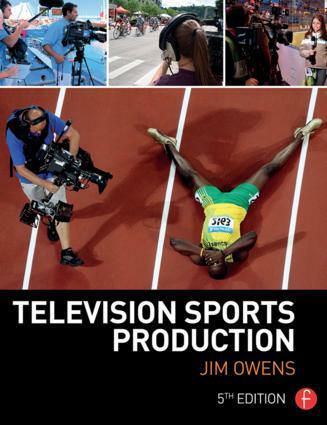 In Television Sports Production, Fifth Edition Jim Owens walks you through the planning, set-up, directing, announcing, shooting, and editing involved with covering a sports event. This manual gives you the tools to effectively cover sports ranging such as football, soccer, and basketball. Tips and advice on using mobile units, cameras, audio equipment, and lighting rigs will enable you to produce live or recorded coverage like an expert and capture professional-quality footage on the first take. After all, there are no instant replays! "We Are Going to Add Show Business to Television Sports"
Jim Owens has worked and taught in the video and television industry for over 30 years. His international television work has included fourteen Olympic broadcasts and has taken him to over thirty countries. He is the author of the Video Production Handbook, Television Production, and Television Sports Production and has had over thirty articles published in television and broadcast magazines in the United States and Europe. Owens is Dean of the School of Communication Arts at Asbury University in Wilmore, Kentucky, where he has taught since 1981.